Random fact: I love driving. There’s just something about moving from one place to another with the control to go wherever you may want to go. Driving is almost like a small break from life. It can be filled with conversation or it can be completely content in silence. Music, however, is the one thing that I cannot drive without. No matter whether the drive is filled with silence or chatter, there has to be a soundtrack to accompany it. After turning on my car, music is the next thing that comes on. The car just seems to empty without it. I love being in my car by myself, allowing me to be the sole DJ. I can listen to whatever I want, play it as loud as I want, and sing at the top of my lungs. To me, driving is completely calming. There is no better time to drive than during the sunrise or sunset. For me, the sunrise symbolizes the starting of something new. It’s a new day and a new adventure. It is completely worth getting up at an obnoxious hour just to take in. A sunset on the other hand, stands for the close of another day. I wouldn’t say it is an ending, but instead a chance to reflect on the day. There is no better time to drive than around the time of the sunset. It just gives me a completely serene feeling. No matter now horrible a day you had or how anxious you are about the next day’s activities, somehow a sunset can calm you right down. Not to mention, they are both stunning. Tonight I found myself driving at this perfect time. As I was driving down the backroads I take from Cambridge back to my house, I found myself driving right into a sky painted by none other than God himself. No one else could put those colours together with such perfection and then paint them on the sky for all to see. 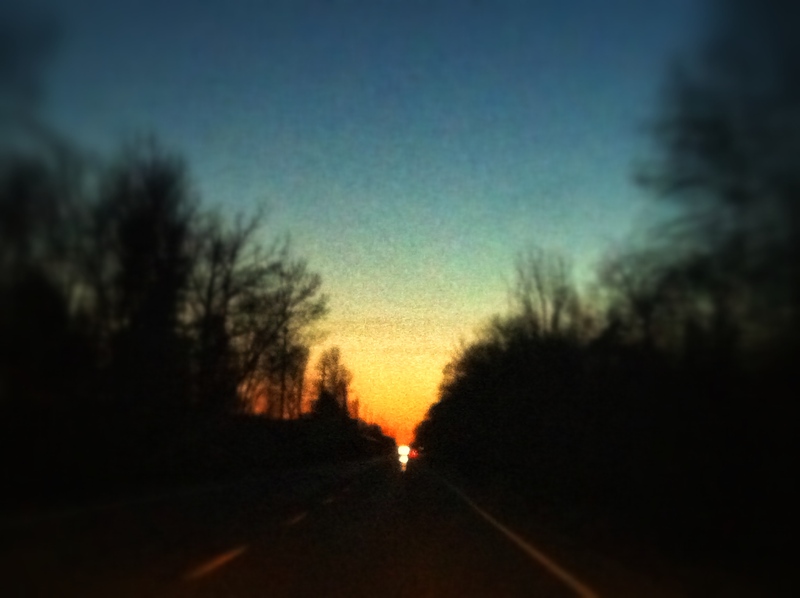 As I continued to drive, I realized what an odd experience this sunset had created. Looking ahead into the setting sun, it was nothing but pink and orange light fading into the horizon. At the same time, looking through my rearview mirror created the illusion that it was the dead of night. If just looking back, you could have been fooled that it was the middle of the night. As I continued to drive, I had this feeling like this was a symbol of my life right now. Ahead all I can see are beautiful colours, light, and God. Behind me was the past, it’s where I had already travelled, where I was coming from. It’s what I am leaving behind and building upon. It’s time to focus on the beautiful colours. It’s time to move forward. It’s time to put my car in drive and just go. (If it happens to be 12 hours south on the I-79, I will not be complaining.) I need to stop dwelling on the past. It has helped me become who I am today and I wouldn’t be here without it, but I need to move on. Whether it be a sunrise or a sunset, just take a moment to enjoy it. Don’t just speed by trying to get from Point A to Point B. Slow down and take in those immaculate brushstrokes painted by none other than the creator himself. Keep moving ahead, but enjoy the drive.